Plot: As the apes suffer at the hands of men so ape leader Caesar wrestles with his darker instincts as he sets out for revenge. 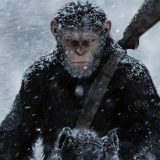 A fitting and breathtaking conclusion to this franchise with a difference, War For The Planet Of The Apes is a blockbuster with a point to make and the guts to challenge you in just the right places while balancing character and entertainment. There is a point around midway through the latest apes trilogy, roughly two thirds of the way through Dawn Of The Planet Of The Apes, where you realise you are no longer rooting for the humans to win. 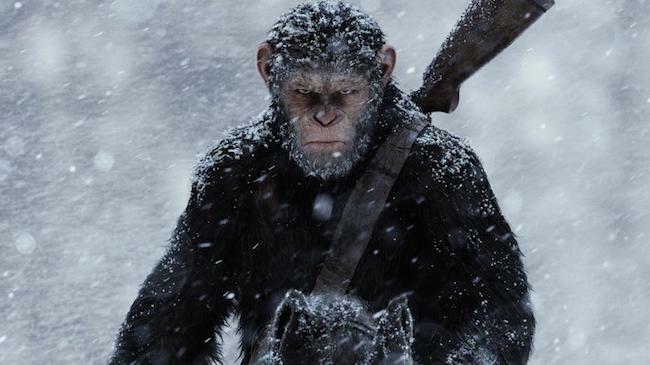 It’s a stroke of genius because now entering the final chapter of the trilogy with War For The Planet Of The Apes means we don’t just hope Caesar and his merry band of apes win the war, we hope they outright rid the planet of us dirty humans. Up until War though there has been equal billing between ape leader Caesar and his human counter parts. First with James Franco and then with Jason Clarke but here Caesar is our protagonist without anyone standing as his equal. Of course, in typical Hollywood style this can’t just happen organically. This is a summer blockbuster after all so character development likes to be writ large on the screen. Which sees Caesar (Andy Serkis) suffering family tragedy at the hands of a covert group of military men and, fuelled by rage and visions of his former right hand man Koba, goes looking for revenge. It is here that co-writer and director Matt Reeves, returning for the second time in the franchise after Dawn, makes his influences clearly felt. Because War is essentially Ape-pocalypse Now. So much so that it is graffitied on a wall at one point. Caesar sets out with a handful of loyal soldiers to find his Colonel Kurtz, simply known as The Colonel and played with surprising, intimidating reserve by Woody Harrelson. From there it is a journey into a heart of darkness as Caesar learns more about the aggression of man and the anger now burning in himself. Along the way he learns of a new mutation of the virus that wiped out most of humanity which seems to take away their voice, the thing that, in theory, makes them civilised. But throughout you are reminded of Ellen Ripley’s line from Aliens, “You don’t see them f*cking each other over for a goddam percentage”. As Caesar’s mantra “ape don’t kill ape” rings large we witness man, despite a united enemy, failing to settle their petty squabbles. All the while the apes remain united. Even when enslaved and treated as nothing more than animals. Yes, the subtext is broadcast loud and proud. Racism as always played a part in all the Apes films and here is no different as the apes are enslaved only to do man’s bidding. Meanwhile the savage apes remain endlessly more agreeable than the violent, aggressive and politically driven men. In the Trump era such ideas are always going to shine brightest in popular culture but it is to Reeve’s huge bravery that such ideas can be expressed in a film aimed squarely at getting bums on seats. And it is with this in mind that all the latest Ape films must be applauded. Not unlike Christopher Nolan’s Dark Knight trilogy these films want to be more than just pure entertainment. They want to plant ideas in your brain and challenge you in a way that few mainstream films dare. Sure, it’s all done with big CGI set pieces but that’s not to say the ideas aren’t worthy of thought. Speaking of CGI, once again special mention should go to wizards who bring the apes to staggering life. At no point do you feel like you are watching a computer rendered ape. The level of detail in their fur and faces is mesmerizing, if you even stop to think that you’re not watching real apes. Andy Serkis motion-capture performance should, if there was any justice in Hollywood (which there isn’t by the way) see him more resoundingly applauded. Such is the gravity he brings to Caesar you bleed with him from start to finish. There is, thankfully, a bit of comic release in the shape of Steve Zahn’s brilliant Bad Ape. An ape who learned to speak at the hands of his human masters in the zoo he balances out moody piece with just the right amount of relief when it’s needed the most. A fitting and breathtaking conclusion to this franchise with a difference, War For The Planet Of The Apes is a blockbuster with a point to make and the guts to challenge you in just the right places while balancing character and entertainment. Not just a contender for one of the films of the summer but of the year.